A slow rendition of “Danny Boy” has been echoing through the halls of Los Angles magazine HQ since Sunday. See, the 77-year-old Tom Bergin’s, which closed this past Sunday due to slow business, was a quick two-minute stroll from our Wilshire offices. And so it was beneath the pub’s shamrocked ceiling that we celebrated countless birthdays, promotions, retirements, and awards, or just soothed the sting of a particularly grueling day with something stiff, brown, and old. In a 2001 article, writer Jesse Katz memorialized the thrilling moment he earned his very own loyalty shamrock, which—along with 6,000-and-some others—still hangs in the place today. 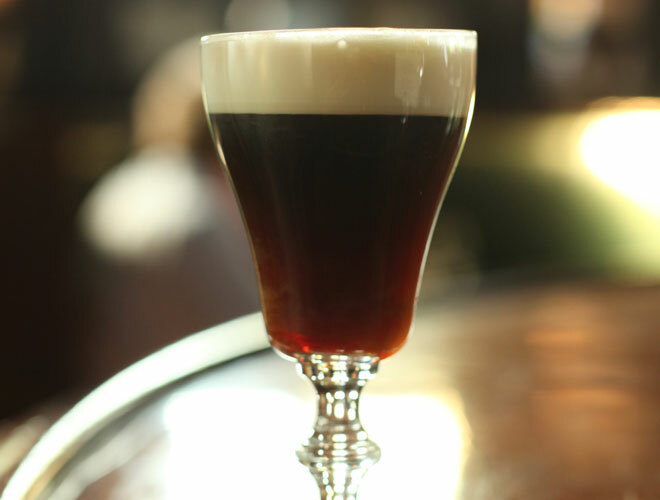 Sure, our staff did plenty of damage to the tavern’s Guinness taps over the years, but there’s no beverage more associated with Bergin’s than the Irish Coffee. Decades before Red Bull and vodka became L.A.’s upper-and-downer of choice, the smooth mix of coffee, Irish whiskey, and cream was perking us up and dulling our senses with one steaming cup. Last year, cocktail wiz Marcos Tello spruced up the drink by stripping it of all the essentials (no Baileys, please!). The result was comforting, simple, and familiar in a way that mirrored the historic watering hole itself. Bergin’s, you will be missed. We raise this glass to you. Fill a Georgian glass with piping hot water, set aside for at least 1 minute. Dump the hot water from the Georgian, add the whiskey and syrup, plus the coffee. Top with fresh whipped Strauss Organic Dairy Whipping Cream. Next articleWalter Mosley’s Novel Approach to Crime in L.A.